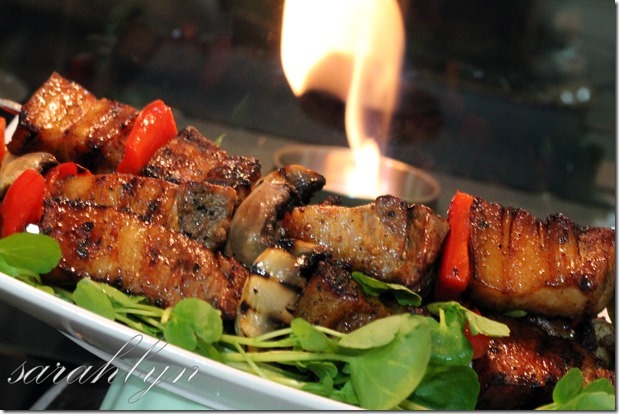 1.Thread pork, pineapple, mushrooms and capsicum alternatively onto metal skewers or bamboo skewers. Season with salt and pepper. 2.Combine plum sauce and reserved pineapple syrup in a small bowl. Brush skewers with some marinade. 3.reheat a char-grill or barbecue on medium-high. Brush with olive oil to avoid sticking. Cook the skewers, turning and basting with marinade, for 8-10 minutes or until pork is cooked through.